Beige Plus is proud to introduce Alembika - a sensational new plus size collection. Alembika was founded in 2005 by fashion designer Hagar Alembik, a graduate of the Shenkar School of Design, and Judith Fadlon PhD, an anthropologist. Beige Plus Creative Director Leanda Walters is extremely selective about the designers that make their way onto the Beige Plus website. We believe that all the designers we stock at Beige Plus should share our brand ethos. At Beige Plus we are absolutely passionate about bringing the most beautifully crafted highest quality designer plus size fashion to our customers. Alembika believes in creating beautiful clothes which use form, colour and texture to create movement and vitality. Graphic prints, mixed textiles and unstructured pieces are hallmarks of this exciting brand. The celebrated label is designed for the woman who wants a contemporary look and who is not afraid to be bold when it comes to shape and print. Layering is keynote of this collection with pieces that work together to create a whole host of outfit possibilities. This layered architectural style of dressing is often described as Lagenlook and it’s one of Europe’s hottest trends. Alembika is for the woman who wants to have fun with fashion, stay cutting edge and who believes that style doesn’t have to mean a compromise in comfort. The fabrics are fluid and fabulous – selected with consideration for form and with an understanding of how the body moves. Alembika is a cross-generational brand that believes that style has no size. When it comes to evening wear a little sparkle is always welcome. Alembika’s After Dark collection is perfect for the plus size woman who is search of more contemporary evening wear. The deep V neck, combined with the Princess cut will create an attractive decolletage and the gentle gathers falling from an empire line waist will flatter your tummy. Turn heads in this beautiful cut divine devore dress. 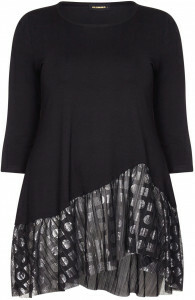 This stunning tunic is also from the After Dark capsule. Made from exquisitely soft stretch jersey with an eye-catching asymetric metallic hem it’s designed to be glamorous yet comfortable and unrestrictrive. Alembika believe that just because you want to be stylish doesn’t mean you have to compromise on comfort. Their casuals are made from beautiful fluid fabrics that are designed to intuitively move with you. Co-ordinate a patchwork jersey maxi dress with a ribbed cardigan to create a chic everyday look. We have added a cardigan to every sleeveless dress so that you have cover for your arms. Beige specialises in finding wonderful clothes for the woman with curves and our latest addition Alembika ticked all our boxes. With years of expertise in plus size designer fashion we know what works and we believe that this new collection will thrill you. We’re so pleased to be able share this innovative collection with you. For sizing information and styling tips ring our customer services on 0208 455 0005 today. Alternatively, you can visit one of our two London stores.